Bangkok (Thailand) – May 8, 2017 (travelindex) – SureStay Hotel Group, the exciting new concept from Best Western Hotels and Resorts, has confirmed that its first ever Asian hotel will open in downtown Bangkok in the fourth quarter of 2017. SureStay Plus Sukhumvit 2 is a brand new premium economy hotel being developed in the heart of Thailand’s thriving capital city. Construction work commenced in late 2016 and is now well underway. Once open, this exciting new hotel will be managed and operated by SureStay Hotel Group, a subsidiary of Best Western Hotels & Resorts. Guests will be offered 85 comfortable and contemporary rooms, all featuring complimentary in-room Wi-Fi. There will also be a “business corner” area providing corporate travelers with a selection of convenient services. “Asia is an incredibly diverse and dynamic hotel market, but one common trend we are seeing is the demand for branded economy and lower-midscale accommodation in key cities across the region. 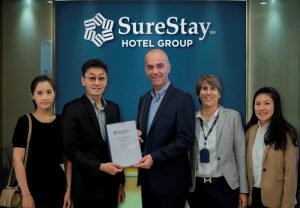 SureStay Hotel Group is perfectly positioned to fill this gap in the market,” said Olivier Berrivin, Best Western’s Managing Director of International Operations – Asia. “I look forward to welcoming the first guests to this exciting new hotel in the fourth quarter of 2017, and ushering in a new era of high-quality, affordable accommodation in Bangkok, Thailand and the whole of Asia,” Olivier added. There are three brand tiers to choose from: the classic economy SureStay® hotel, premium economy SureStay Plus® hotel (which includes SureStay Plus Sukhumvit 2), and lower-midscale SureStay Signature Collection®. These three brands deliver gradually increasing levels of quality and facilities, which will be consistent in all locations around the world. To ensure that high standards and guest satisfaction are maintained, all SureStay hotels must achieve a TripAdvisor® score of 3.5 and above. SureStay Hotel Group has already approved more than 30 properties, mainly in North America. By the end of 2017, the group expects to have expanded its global portfolio to 100 hotels, making it one of the fastest-growing brands in the industry. A subsidiary of Best Western Hotels & Resorts, SureStay Hotel Group is a new hotel franchise that gives value-oriented travelers an exceptional travel experience at an affordable price. There are three distinctive brands under the SureStay® umbrella – SureStay, SureStay Plus® and SureStay Signature Collection®. All SureStay branded properties have achieved and must maintain a TripAdvisor® score of 3.5 or higher – providing guests with the confidence they will receive a high-quality stay with outstanding service. Properties must adhere to the SureStay Service Promise and meet Best Western’s brand standards, which include well-appointed guestrooms, high-speed internet access and complimentary breakfast. SureStay also offers an instant-rewards guest loyalty program – SureStay Rewards℠. For more information, visit surestay.com.